Trie is a classic data structure (Idreos et al., 2018) that is widely used in key-value store (Zhang et al., 2018; Wu et al., 2015). In this post, we describe the basics about the data structure. Finding all keys with a common prefix. We have to traverse all keys in hash table, which can be \(O(n)\) (\(n\) is the number of keys inserted). However, trie takes \(O(k)\) (\(k\) is the length of the prefix). Enumerating a dataset of strings in lexicographical order. There is a sorting on all strings (i.e. keys) and thus \(O(n\log n)\). However, trie takes \(O(n)\) time only. Compared to hash table, trie saves space when storing many keys with the same prefix. Search in balanced tree can take \(O(m \log n)\) time. However, trie only takes \(O(m)\). To avoid unnecessary complexity, we assume we are working with a collection of strings which consist of only lower case alphabetics. An array of \(R\) links (links), with each link representing one letter. 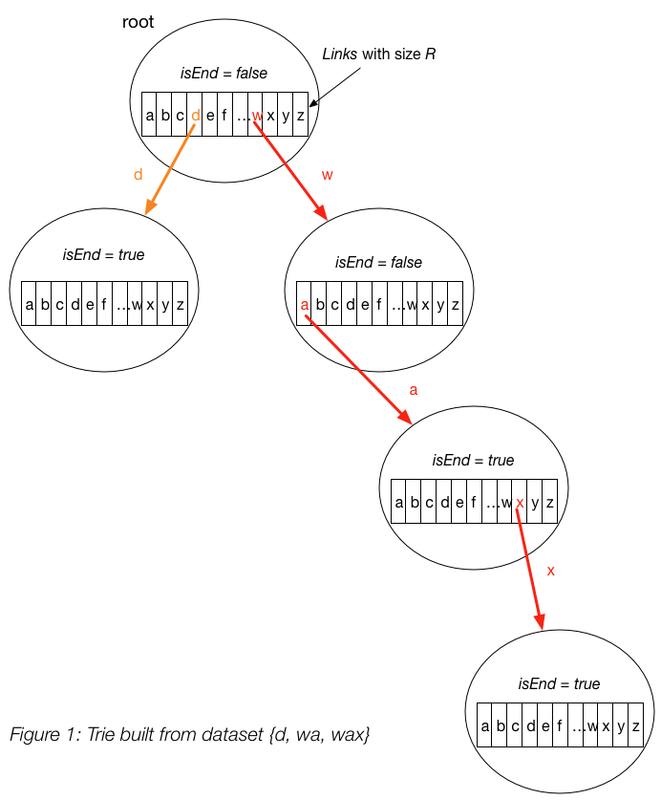 A link connects two trie nodes together. In our example, we have \(R = 26\). A boolean variable isEnd, which indicates whether we reach the end of a string. This is needed because if we are searching for a prefix, we should have isEnd = false. On the other hand, if we reach the end of a string, we have isEnd = true. Please note that isEnd = true doesn't indicate that we are at leaf node of the trie. The boolean only indicates whether we have reached the end of some string. In Figure 1, the end nodes of "wa" and "wax" are connected with each other. If we require that there is no common prefix for the string (e.g. strings in the dataset don't share the common prefix), we then don't need isEnd boolean variable. A link exists. Then we move down the tree following the link to the next child level. The algorithm continues with searching for the next key character. A link does not exist. Then we create a new node and link it with the parent's link matching the current key character. We repeat this step until we encounter the last character of the key, then we mark the current node as an end node and the algorithm finishes. A link exist. We move to the next node in the path following this link, and proceed searching for the next key character. There are key characters left, but it is impossible to follow the key path in the trie, and the key is missing. No key characters left, but current node is not marked as isEnd. Therefore the search key is only a prefix of another key in the trie. The approach is very similar to the one we used for searching a key in a trie. We traverse the trie from the root, till there are no characters left in key prefix or it is impossible to continue the path in the trie with the current key character. The only difference with the mentioned above search for a key algorithm is that when we come to an end of the key prefix, we always return true. We don't need to consider the isEnd mark of the current trie node, because we are searching for a prefix of a key, not for a whole key. We implement the trie data structure in C++ here. We use a sequence of 1 and 0 to represent character in Huffman Codes. Thus, \(R = 2\) (e.g. 1 and 0). However, to figure out the 0-1 encoding of each character, we cannot simply insert the character into trie. We should use Huffman algorithm instead.